decorates cakes, pastry, or biscuits, with butter cream, icing, jam, etc., using tubes and small moulding tools, and embellishing with nuts, cherries, etc., as directed; copies samples received from designer q.v. or works under direction and .supervision of designer. see mixing machine minder (biscuits). (ii) in small establishments, an experienced worker able to perform all operations connected with baking; is senior in bakehouse and directs operations of mixing, moulding and baking, checks temperature of oven, etc. ; cf. second hand, third hand. in baking establishment, mixes, kneads, cuts out, etc., by hand, pastry required for biscuit and cake making; may also bake in oven, see ovensman. performs any or all of operations involved in bread making at Jewish bakery, i.e. dough making, table work, etc., in case of making ordinary white bread containing yeast and salt; also participates in and superintends mixing of rye meal (containing salt hut no yeast), kneading of dough, and baking, and wiping over with potato water during baking of rye bread. using a spill, i.e. a metal disc mounted on a long wooden rod, expeditiously removes circular matzo bread, i.e. Jewish Passover bread, as it completes the circuit in a revolving open-fronted oven, the fire of which is built round the edge of the oven; stokes fire and regulates speed of rotating oven by power switch; where trays are used, places trays containing matzo bread into rotating oven and removes when matzo is baked. performs any or all of duties in a bakehouse, see baker, pastry cook; is usually engaged in small establishments, where he makes and bakes bread, mixes ingredients for cakes and pastry, and either himself shapes and bakes cakes or superintends shaping and baking. is employed in a small establishment to assist baker q.v. in any of the kneading operations, to attend to oven, to stoke fires, to carry loaves to and from oven, etc. ; cf. second hand, third hand. general term for any person tending a doughing, cutting, dropping, rolling, or other machine used in biscuit making, including brake operator, dough breaker, machine minder (biscuit), mixing machine minder q.v. is one of two men who operate brake machine for compressing, with rollers, kneaded paste into sheets, preparatory to biscuit stamping, see biscuit machine minder; cuts, from a tub, piece of dough, approximately � cwt., according to size of which he adjusts rollers of machine, raising or lowering them by means of levers; sets rollers in motion, feeds dough thereto and stops machine when dough has passed through; turns in ends and sides of flattened dough, lessens space between rollers, reverses machine and re-rolls dough; continues these operations until dough has acquired correct consistency and thickness; finally, cuts dough, by hand, into suitable sizes and lifts it on to table near biscuit machine. general term distinguishing skilled operatives engaged in bread making as distinct from cake making, etc. ; cf. baker. mixes ingredients, either by hand or in a mixing machine, for cakes, buns, scones, and other small goods, and sometimes also for pastry (except in establishments where a separate pastrycook q.v., specialising in pastry goods, is employed); kneads, rolls, shapes, and bakes cakes, etc. mixes ingredients for cakes, either by hand, kneading, etc., in bowl or similar vessel, or by machine; duties in latter case, as for mixing machine minder (biscuits). a pastrycook q.v. or a cake baker q.v. making and baking cakes, pastry, etc., for confectionery side of a retail baker and confectioner's business, as distinguished from bread baker who makes and bakes bread only. (ii) mixes a paste of flour and isinglass with a little yeast in a mixing machine, see mixing machine minder; places paste in cornet moulds and passes them through oven; removes trays of dried contents and trims them in a press; sometimes also fills cornets with cream, jam, etc., though this may he done by another worker, e.g. a pastrycook or cake maker q.v. a decorator q.v. who designs floral and other fancy shapes in cream, icing, and jam, sometimes embellished with nuts, cherries, etc. ; directs and supervises assistants (cake decorating) q.v. who carry out these designs; sometimes does best class of decorating himself throughout. mixes ingredients for dog biscuits in a mixing machine; duties vary according to type of machine, but usually either empties weighed ingredients into hopper of machine, and starts or stops machine by moving a lever or is in charge of machine or machines forming part of a series, connected by automatic devices. (ii) a baker's assistant q.v. who breaks dough after it has risen, by hand, in preparation for kneading. in large establishments , is exclusively engaged in dough-making processes, e.g. mixing, kneading and setting sponge; for operations, see kneader (hand), mixing machine minder. mixes icing sugar, white of egg and flavouring essences; applies mixture to cakes and pastry with flat knife or with icing tube; may also assist in other operations in bakehouse, e.g. mixing or baking; cf. ornamenter. kneads dough in a wooden trough, working it backward and forward with fists and elbows, turning it over and over until ready; in small bakehouses, performs other work as well as kneading, e.g. moulding, see moulder (bakery), or assists at oven, see ovenman. see mixing machine minder (bread). operates machine which rolls prepared dough to required thickness and which cuts and stamps it to size and shape required; adjusts rollers by means of handles and screwing arrangements; fixes and adjusts cutters and dies, according to biscuit required, by means of nuts and bolts; regulates speed of machine according to consistency and composition of dough, which in turn is governed by weather conditions. works at small mixing machine, brake machine, etc. (see mixer, brakesman, etc.) or is stationed below in bakehouse; in latter case, performs one of several operations, either picks stamped matzo (Jewish Passover bread) shapes from travelling band, or, placing a disc across palm of hand, throws on to stone bottom of revolving oven in such manner that the matzo lies perfectly flat and uncreased, or receives and stocks baked matzo from matzo baker q.v. ; where trays are used, places matzo in trays and/or feeds oven with filled trays. a mixer q.v. who mixes ritually cleansed wheaten flour (obtained from court of chief Rabbi) and water into a stiff paste to make matzo, i.e. Jewish Passover bread. a brake operator q.v. who operates machine for rolling-out, perforating and cutting into rounds,, the stiff paste for making matzo, i.e. Jewish Passover bread. empties, by hand, flour and other dry weighed ingredients for biscuits paste (cf. mixing room worker (449)) from containers into receptacle of machine; adds milk or water from measures and starts machine by means of levers; tests state of paste by sight and touch, and, when correct consistency has been obtained, stops machine, releases paste receptacle and wheels it to brake operator q.v. ; is not interchangeable with mixing machine minder (bread) q.v. feeds mixing and kneading machine alternately with flour and hot water, adding salt and yeast, by filling hoppers, which, when full, contain correct amounts to be fed; pulls hoppers into position above machine and empties by means of hand wheel governing hopper elide; starts machine, by means of a lever, and after about ten minutes, tests by hand, consistency of dough; during kneading, pulls adhering dough from sides of machine to ensure thorough mixing; stops machine when kneading is complete, tilts dough by releasing lever, and pulls it out by hand into an adjoining trough to be wheeled away, -weighed, moulded and baked; is not interchangeable with mixing machine minder (biscuits) q.v. in large factories, is sometimes engaged on making puff pastry by means of mixing machine; as for mixing machine minder (biscuits); cf. paste maker (puff pastry). (ii) see moulding machine minder. divides biscuit mixture into portions, and moulds and shapes, by hand, with fancy cutters, into biscuits of the cake type, e.g. fairy cakes; cf. machine minder (biscuit). sets bread moulding machine in motion; cuts quantity of dough from a trough, and places it on canvas belt conveying dough to be automatically cut, weighed, shaped, and carried forward; periodically tests weight of machine-cut dough, on hand scales, to ensure that machine is working accurately. a baker q.v. engaged on hand mixing and kneading dough, and moulding and baking it to make muffins; at large establishments, where quantities of muffins are made during winter months, receives dough ready mixed and kneaded from mixing machine minder (bread) q.v. mixes oatmeal, butter, salt and water into paste by hand, in bowl or similar vessel; rolls paste, by hand, with rolling pin; stamps or cuts out cake shapes with hand cutters, and bakes them on a girdle or hot plate. at a large factory, builds up ornamentation on cake with icing sugar, fruit, etc., working from no set design; occasionally, roughly designs cake on paper before ornamenting; cf. pastrycook. (ii) biscuit baker; in small establishments, bakes bread, biscuits, and cakes in a tunnel-shaped oven having fixed bottom (not rotary); regulates heat of oven and tests by touch; inserts bread, etc., by hand, in oven, inspects from time to time during baking, increases or decreases heat, if necessary, and removes bread, etc., when baking is complete; if engaged on rotary oven (unusual), regulates speed of chains to suit bread, biscuit, or cake making; work may he done by baker, second hand, or third hand q.v. a pastrycook q.v. who specialises in making parkin, a cake (or biscuit) of oatmeal and treacle; mixes treacle and oatmeal into paste, by hand, in bowl or similar vessel, rolls it, cuts it, by hand, into cakes, and bakes cakes on hot plate or girdle. specialises in making puff pastry; mixes ingredients, by hand, or receives ready mixed paste from mixing machine minder q.v. ; rolls and cuts-out shapes, adds jam, etc., decorates, and hakes, or superintends baking; cf. pastrycook. duties vary according to type of establishment, but usually mixes ingredients for pastry, and often also for cakes, buns, and other small goods; in some establishments, specialises in pastry as distinguished from cake baker q.v. ; kneads, rolls, and shapes, by hand, pastry, etc., and bakes in an oven; stokes fire and regulates heat of oven by moving dampers in or out to control draught through flues or gives directions as to stoking of fires and regulating of heat; sometimes also shapes, raises and bakes hollow moulds to enclose pheasant, rabbits, etc., see pie raiser; in small establishments, often makes wedding cakes, and does work of decorator q.v. ; is often able to make pies, boil jams and cook meat. in large catering establishments, specialises on pie making and baking; may be assisted by pie raiser q.v. or more generally, carries through whole operations, i.e. makes paste and shapes pie, by band, fills with meat and bakes; work done by baker and confectioner q.v. in small establishments. shapes raised or hollow tops for pies, by pressing thin paste over a wooden mould of required shape and size, inverting mould and lifting it, leaving shaped paste on table or bench; cf. pastrycook, pie maker. as for pie maker ; cf. small goods maker (448). a pastrycook q.v. who specialises in making scones; mixes, by hand, flour, sugar, milk, butter and baking powder into a light dough; kneads, rolls-out and moulds into circular flat cakes and bakes them on a hot stone, hot iron plate, girdle, or in oven. a working foreman having only one or two men under him; takes part in mixing, baking, etc. ; is usually engaged in small establishments. in small establishments, does any skilled, work connected with baking bread, and sometimes, biscuits, cakes, etc., as chief assistant to baker q.v. ; takes charge in absence of baker. breaks eggs and weighs out sugar into special mixing machine; pours mixture into bath, adds weighed quantity of flour, stirring it in, by hand; greases tins and pours in sponge mixture ready for cooking; work often performed by pastrycook q.v. in small establishments. 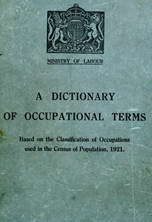 general terms for any worker engaged in weighing, moulding, or other work done at a table, as distinguished from ovenman q.v. a youth, generally an apprentice or an improver, employed on one or all of baking operations (see baker) according to his ability. starts and stops machine, which is automatically fed with wafer paste, by moving lever; regulates temperature of moulds by turning up or down gas jets which heat moulds, or otherwise; removes sheets of wafer as they come out of machine, and places them ready for wafer cutter q.v. ; is sometimes also in charge of other machines, e.g. cornet making machines; cf. cornet maker.